With the USA National Championship Western Regionals at Treasure Island on May 30th and 31st (more on that below) , Northern California had the chance to show at least the western half of the country why Pelicanland is considered the hotbed of American rugby. EPA Razorbacks had stormed through the season and into the playoffs, Colusa had met every challenge and was raring to go. The Amazons had held off all opposition with power and flair. Life West had nary a close match all year. It was a foregone conclusion that all of the Nor Cal teams would advance. Oops. Apparently the rest of the country no longer sees us as the invincible, all conquering champions. In the D1 quarterfinal, in particular, EPA were thoroughly outclassed and outplayed by a solid, well drilled Dallas Reds side. Colusa fought well but were downed by Wichita. Only the Amazons and Life West won on the first day and the second day was even harder. Life West needed an epic comeback in the final 5 minutes just to force overtime and the Amazons were pushed to the limit. They both did manage to go through and will be playing for a national championship so good luck to both squads. The changing of the guard was never more evident, however, than in the Men’s D1 final: Dallas vs Austin. Has the country’s rugby epicenter moved to Texas? For this year it may seem so, but I see Northern California reasserting itself next year as harsh lessons were learned. On that note, on Sunday after finishing my AR duties at the National West Regionals your humble scribe was asked to be the PA announcer for the final two matches. As always, I tried to have a little fun. The final match of the day (National D1 semifinal) was Dallas Reds v Austin Blacks. Red v Black. At halftime and every injury stoppage I started playing over the PA the classic Les Miserables anthem “Red and Black”. I mean, really, for this rugby match what could be more appropriate than deep, powerful operatic voices singing “RED!! BLACK!! RED!! BLACK!!”? You know, I really do crack myself up. In case anyone wants to know exactly what I was playing, go here: https://www.youtube.com/watch?v=T3MAwJTRNwo&feature=youtu.be&t=138. That link should take you to the first clip, but for reference I used the bits starting at 2:18, 3:15 and 3:42. It may come as a shock to many of the loyal reader of Hail Pelicus but the referees are not always the stars of the games and, in fact, are even not necessarily the reason for rugby in Northern California. I’ll pause a moment for you, dear reader, to digest this truth. The USA will be playing in the NACRA 7s Olympic qualifier in North Carolina this Saturday as well. Details can be found on usarugby.org. Both fields of the NACRA Championships can be viewed live online worldwide – at USARugbyTV.com. The men are riding high from the Cup victory at the London 7s and need to keep the momentum going. The women also are coming in strongly after upending Fiji and New Zealand in their last tournament in Amsterdam. Go Eagles! With the 15s season staggering to an end the summer 7s season sits beckoning us all forward for more rugby fun. During the long, languid months of the summer and fall Hail Pelicus will be published, but less frequently. Probably about once a month when a roundup of all the local 7s tournaments will be published. In essence, they will come out when I feel like doing it. Regular weekly service will start again in January at the latest. Once again the flock will be coordinating our banquet around the USA National team schedule as the United States Eagles take on Samoa and Canada takes on Japan in San Jose. The Pelican Elders will be holding our Annual Awards Banquet in San Jose on Friday, July 17 HOWEVER the location is now a closely guarded secret. Once word leaked out about the planned venue being the Sonoma Chicken Coop there was a massive chicken uprising. It was horrible. You have not known fear until you have had a maddened chicken coming at you at groin height, feathers flying and a look of pure desperation in its beady eyes. The event will take place, however, so if you haven’t already please RSVP via email to Jim Crenshaw at crenshaw@cal.net with how many guests you are bringing. Location: Cluck cluck, SQUAAWK!! Noooooo!!! Not the groin! Hi Lazy, and thanks for the question. In spite of what your mates in the forward pack think, your friend is actually correct. You need to be in better shape to both play and referee sevens. Yes, the games are only 15 minutes long with 7 minute halves but it is played on a full sized pitch and you spend a considerable amount of that time sprinting. Now is the time to start your sevens training regimen if you haven’t already as Pelicanland is experiencing a glut of sevens tournaments and we will need every available whistle blower. EDITOR’S NOTE: The weekend of May 30 and 31 saw the USA Rugby National Championships Western Region compete at the SFGG fields on Treasure Island. While Nor Cal was richly represented in the refereeing and assistant refereeing corps, not to mention the sterling #4s, these were national appointments and there were several referees flown in who were either USA A Panel or promising B Panel referees. These referees are collectively known as the Northern California B Panel. Several of them even consented to send me reports of their matches which makes them, at least temporarily, Honorary Pelicans. HAIL PELICUS HONORIUM! Of course, Josh Pendegrass, George O’Neil, Phil Akroyd and Marquise Goodwin all know better and should feel great shame for not contributing a report. It was the Division II national Quarterfinal, and both teams attacked the game with fervor for a full 80 min. Tempe were superb at maintaining possession and seemed to be running downhill. They recycled the ball at lightning speed, and despite a stalwart defense by Dallas Rugby, consistently put points on the board. Dallas showed great poise to maintain intensity and focus on the match for a full 80 min. and fought hard to put some points on the board late in the match. Both teams played with excellent spirit. 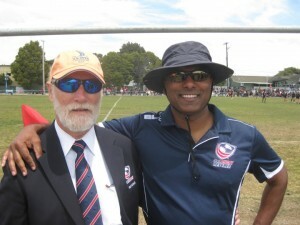 Thanks to the NorCal referees for their hospitality and tradition of impressive rugby. A fairly lopsided match that saw EPA commit a wide variety of errors, with the Reds capitalizing on almost every one of them. The match kicked off at 5 PM on Saturday and by that time, the sun had receded behind the clouds and the chilly wind picked up, mirroring the early morning conditions. The pitch was in great shape despite the four matches played on it prior to this match. Both teams were evenly matched in size and physicality, and both seemed to possess similar skills in what on paper appeared to be a very competitive match. This was not the case as EPA found it difficult to maintain any consistent possession, discipline and cohesion among themselves. Frequent handling errors plagued EPA, which was caused by both sloppy, 50/50 passes and poor handling. The Reds scored their first try of the match as a result of EPA knocking on 5 meters from their own goal, with a Reds player in close proximity to gather the loose ball and score with ease. Dallas were up for the challenge in regards to meeting the big, strong Razorbacks at each gain line, making one tackle after another and missing none. Despite three tries and one penalty goal in the first half, the Razorbacks were only down 18-0 due to a poor display of kicking from the Reds that included three missed conversions and one missed penalty, that if made, would have left EPA down 27-0 and probably out of contention for coming back. The second half wasn’t any kinder to EPA though, as the mistakes kept piling on and with Dallas reluctant to take their foot off of the gas. Frustration and arguing began to set it among the Razorbacks, only furthering their problems. Throughout the match, EPA consistently made their way into Dallas territory, stringing some well developed phases together, but only to squander the opportunity to make it a game. The final score ended up being 35-0 with EPA feeling disappointed and dejected from the poor effort. Dallas clearly had a game plan going into the match and were able to stick to it for 80 minutes. They committed very few errors, were patient to wait for their opportunities and for the most part, maintained their composure throughout. Unfortunately for EPA, they did the exact opposite and paid the price. Lots of breakaway running at Treasure Island as Life West rampaged all over the field. St. Louis had the edge in scrums and mauls, but could not keep up in open play. Much thanks to Dan Wilson and John (Buffalo/San Diego) for their help as AR’s. It was the D1 consolation match on Sunday following the Division I national quarterfinals. Both teams had lost hard matches the day before and would be looking for a win against their local rivals. It was certainly expected that this match would be hard-hitting and contentious. The result was a spectacular match with both teams trading the lead through the first half. EPA extended the lead to 15pts at the start of the second half, then lost a player upon a send-off. Belmont Shore methodically chipped away at the lead, yet the EPA Razorbacks were just out of reach for the Belmont shore second side even up to full time, when the Belmont wing was forced into touch in the corner while attacking for the win. This was a tightly contested, back-and-forth game in which the outcome could have easily gone either way. Wichita (Kansas) was a bit more structured, which enabled them to punch their ticket to the national final in Glendale (Colorado) in two weeks. Much thanks to Brad Cole (Tennessee) and Preston Gordon for their help as AR’s. EDITOR’S NOTE: It wasn’t all USA Playoffs that weekend. We had a high school all star event as well. In a selection game for the NorCal allstar team, Bay Area vs Sacramento. While it was only a JV game, both teams had some great athletes and solid rugby skills. Both teams played well but Sac was able to capitalize on a few missed tackles for breakaway tries. This game was a selection camp for the NorCal girls high school all stars team that will head down to play against SoCal later on this month. The Bay Area team dominated the first half, with several breakthroughs of tackles, quick support, and speedy runs around the edges to rack their score up to 43 points before half, without letting the Sac Valley get a try in. The Bay Area girls did not get brought down easily, and they had quick backs, particularly their #13. The second half was a bit more even, with Sac Valley scoring a pair of tries themselves and staying in the game. On both sides, there was smart rugby, quick thinking, and strong rucking. The NorCal high school program is going strong! Pelicus Editorem Minimus, Ex Dux and Pelicus Ex Selan enjoying the rugby action at Treasure Island. This entry was posted in News on June 10, 2015 by James Hinkin.